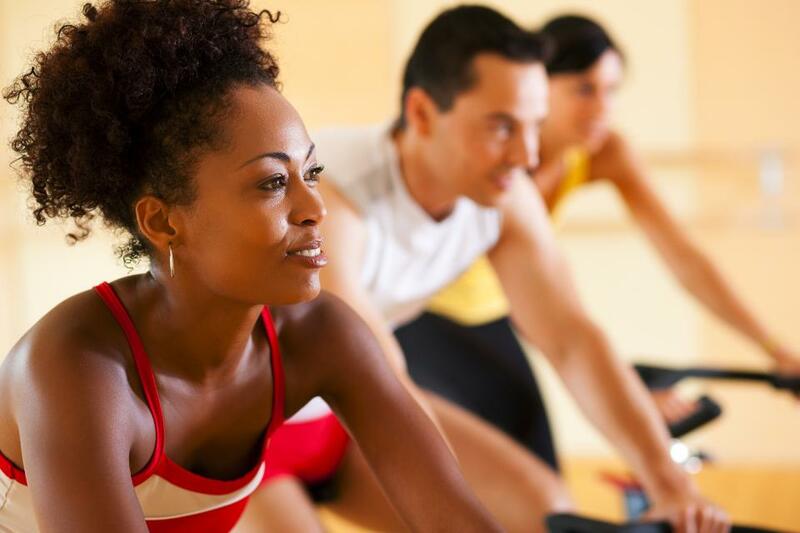 These 10 tips will motivate and inspire your indoor cycling class and keep people coming back for more. Start bonding with members the minute they walk in the door. Use the bike-fit moment to get to know newbies and calm their fears, suggests Jay Blahnik, Schwinn® master trainer based in Laguna Beach, California. Indoor cycling has a tougher-than-tough reputation, so many first-timers are nervous that they won’t be able to handle it. Even if your class is full of regulars, offer to recheck bike alignment. “Use this time to connect and make old-timers feel welcome and appreciated,” says Blahnik. Too much touchy-feely talk can get corny. “One instructor started her class by asking us to ride from our souls,” says one club member. “I mean, really?” It’s fine to ask members to zone in and focus on their rides, but choose your moments (and your comments) wisely. “You don’t have to talk the entire class,” says Rosemary Hohl-Chriswisser, MS, a Schwinn master trainer and professional triathlon coach based at Life Time Fitness in Austin, Texas. “Stick to one visualization per class if you do them at all, and use instrumental music (like Robert Miles’ ‘Children’), so that your story does not compete with lyrics,” recommends Hardy Pollard, a cycling instructor at The Houstonian in Houston. It’s one thing to be positive and motivating. It’s another for the instructor to yell ‘Woo hoo’ for 45 minutes. “Make sure that coaching doesn’t turn into senseless cuing,” says Dixon. “Comments should add depth and clarity.” Focus instead on creating an incredible playlist. You won’t have to whoop, because your members will do it for you. Indoor cycling may have such a grueling reputation precisely because some instructors push participants until they can hardly pedal. “Some teachers keep telling you to ‘turn it up’ after you’ve already reached your limit,” says Mick Emmett, a club member in New York City. Could this be you? Notice how students respond to your cues. Are they ignoring you? What you’re saying may be annoying or unhelpful. Are they adjusting their resistance or position after you cue them? If not, you may be asking them to do something that does not feel right. “Instead of yelling at students to ‘Go, go, go!’ all the time, acknowledge that some folks need to work harder, but some may need to go easier,” recommends Derby. The right song can also help give the class a surge of energy. A song with rising crescendos can help rev students up. The final minute of Mary J. Blige’s “No More Drama,” the upbeat chords in Coldplay’s “Viva La Vida,” the chorus bursts in Def Leppard’s “Photograph,” the last 2 minutes of Snow Patrol’s “Open Your Eyes,” the final sprint in Black Country Communion’s “Song of Yesterday” and the frenzied buildup of Foo Fighters songs like “All My Life” and “The Pretender” can spur the class to push harder, but without feeling like doing so takes extra effort. “One instructor brings in charts to show what happens with lactic acid, and walks around to every single bike to show it,” says one student. While explaining the science behind the workout is a good idea, knowing how much detail to give is key. It’s safe to assume that the majority of students will find the science less interesting than you do. Give them enough information to increase their awareness, but always remember that it’s a workout, not a university lecture. Instructors who teach lots of classes can get bored. It’s natural to try to spice things up and get creative. However, those changes should be shaped by sound training principles and biomechanics. What does that mean in practical terms? “No psycho-spinning,” says Richard Lehman, a Spinning instructor with Christi’s Family Fitness in Vero Beach, Florida. Pedaling at paces greater than 110 rpm [revolutions per minute] not only means that momentum, not leg power, is generating pedal speed; it also means that fewer calories are burned, since less physical effort is required. Plus, the lack of control over the pedals can mean twisted knees if a rider’s foot slips even a little bit. “Help students learn to pedal with enough resistance so that they have the sensation of real road under their bike,” says Lehman. “Don’t do push-ups on the handlebars,” says Melissa Morin, the regional group exercise manager for the Reebok Sports Club and The Sports Club/LA in New York City. “There is not enough resistance in that position to obtain strength benefits for the chest or arms.” Plus, the repeated forward flexion of the lower back can overload spinal disks and contribute to wear and tear—or worse. Let them sing, but not dance, to the music. A bouncing bottom on the saddle usually means students have too little resistance. If they feel the need to use their bodies to press through the pedal stroke, suggest they lower their resistance to where their legs alone can handle the load. “Stay out of the superslow zone,” Roberts continues. “Occasionally drop down to 50 rpm, but aim for pedal speeds that stay mostly within the 60- to 90-rpm range.” While it’s true that on an outdoor ride you might encounter a hill that is so steep that revolutions per minute drop low, you change the gears to lighten the load on your joints and, at some point, you get off the bike and walk it up the hill. Your job is not to overload students with resistance, but to strengthen them with gradual doses of increased resistance so that they are better able to cope with hills as they become stronger.